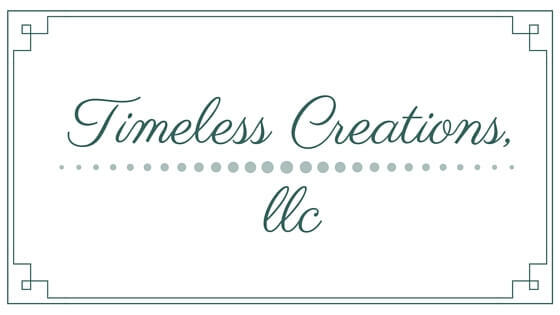 Welcome to the Christmas Festival Blog Hop! A week filled with amazing DIY’s, porches, recipes, mantles, and tablescapes all decked out for the holidays by some very talented bloggers across the web! 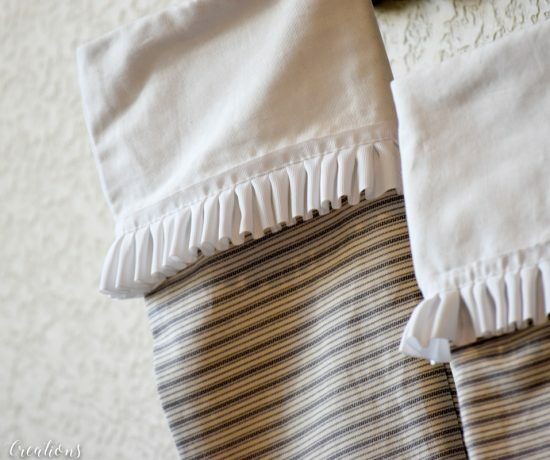 We just love having Kendra of Joy in Our Home put these together. They are always super fun, and some wonderful inspirations come from the challenge of creating great ideas for all of our followers. Yes YOU! You wonderful followers, you. None of us would be here without you! 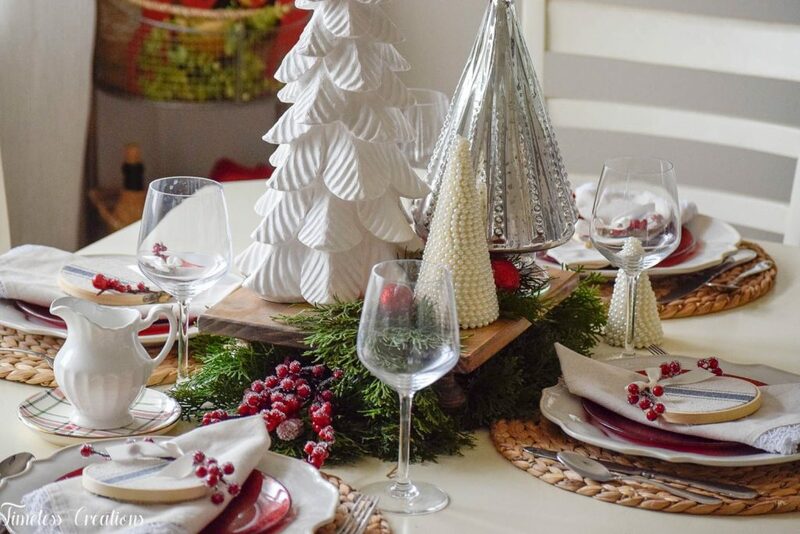 Now get ready to see some absolutely beautiful holiday inspirations! If you are popping by from Rain and Pine we want to say “hello”! 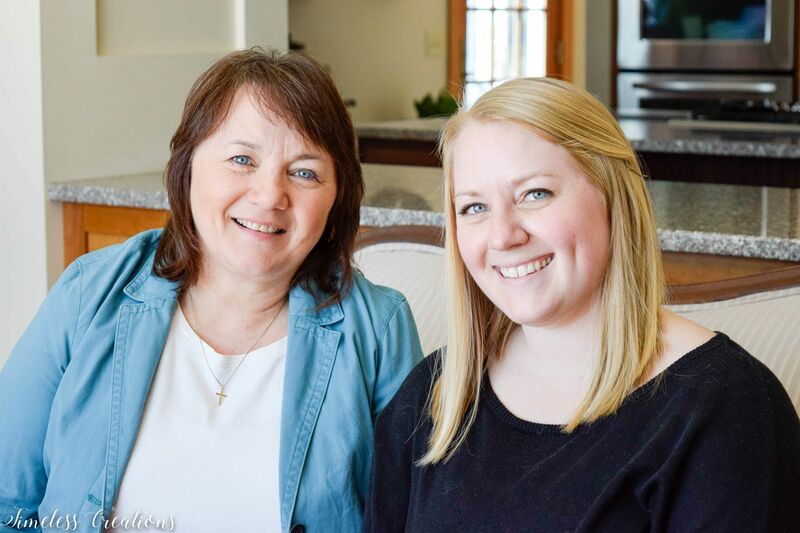 We are a mother-daughter duo who restyle furniture, decor and love to share our home decorating and remodeling adventures! 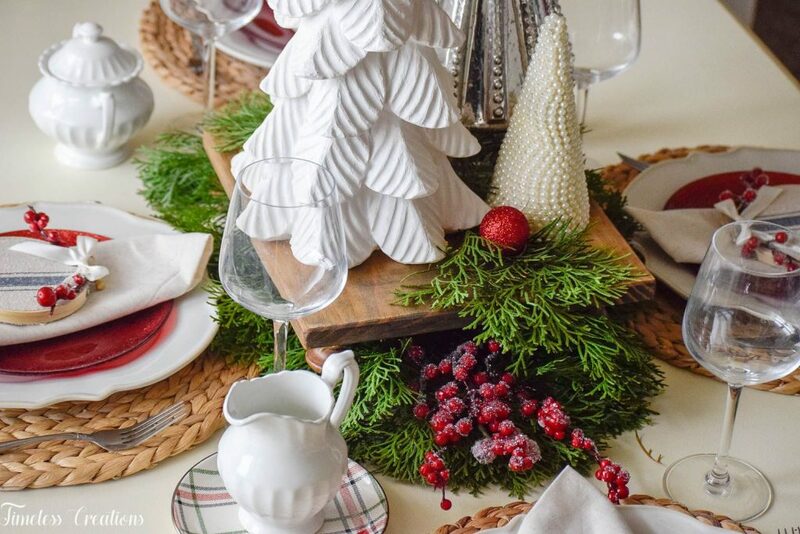 We chose to create a very festive Christmas tablescape for the holiday season. If your entertaining this year we hope to give you some kind of inspiration to help you with your own decorating! 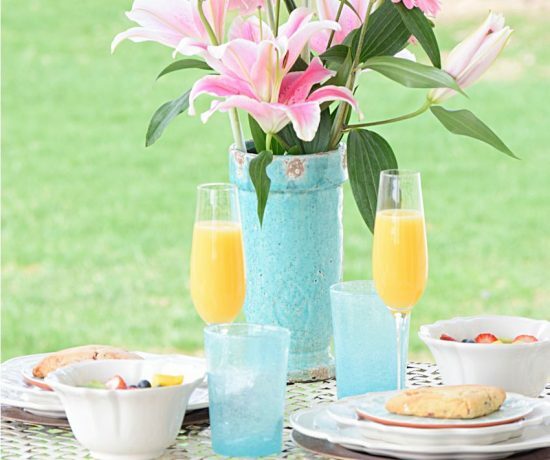 In creating a pretty table setting we like to simply use items we already have on hand. Some are everyday items we already had out and just added Christmas decor to, and some we made! 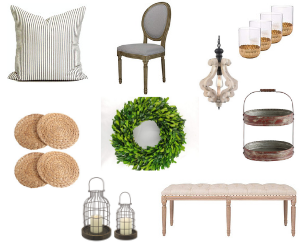 While our table is never fully decorated every single day, I find it easy when your looking to entertain to just pull different items from around the house instead of continually buying new and having to put back in storage. I snatched those trees in the centerpiece from a couple different spots around the house. The pearl trees we made ourselves and had some in our brick & mortar store. And the white tree was by our TV to begin with. It was easy to replace the white tree with a mercury glass candle holder we have out everyday and steal it for the table instead! All of the trees are sitting on one of our most popular items we make for our store and have in our Etsy store! We make 5 different sizes of those beautiful Farmhouse risers! This particular one is stained but we make them in distressed white too. They are so adorable! The large ones are seriously PERFECT for a centerpiece on the table. The 3 small sizes are wonderful on the counter, in a bathroom, on a shelf or side table. The possibilities on these are seriously endless. So we used one to help elevate our decor, almost like a raised tray (with the most adorable little turned feet!). The greenery I cut from trees we had in our backyard, and the red berry picks were taken from the back of the christmas tree! Again, no one would notice they were missing so it was easy to just take that decor from somewhere else for a quick table. And as far as all the china goes for the place settings, we used mostly everyday items just accented with some festive holiday plates. The woven placemats are my favorite which we use all the time! They bring great texture to the table, and help add the warmth of the wood tone across the table to match the riser. Those beautiful white plates are another of our favorites. We use them ALL the time. (Find them HERE). 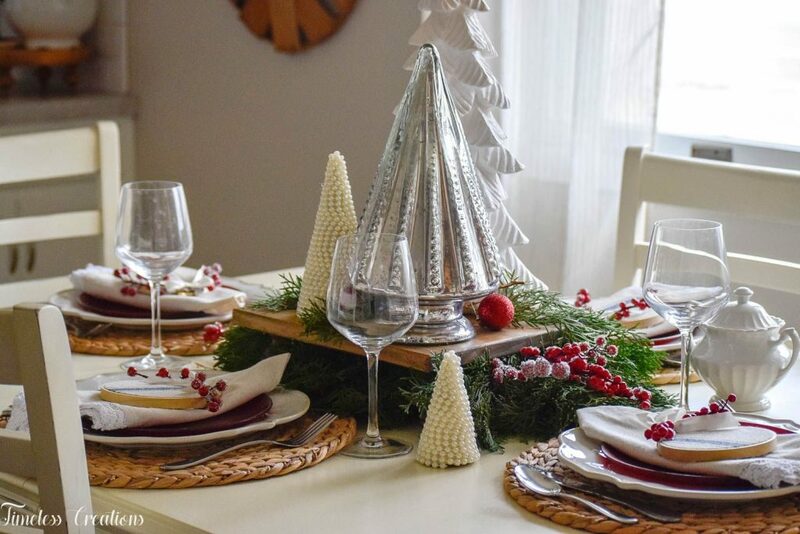 The red sparkle salad plates were the only item we bought this year for Christmas decor! It was a TJ Maxx find for only $7.99! Of course I wasn’t really looking for them, but once I saw them I knew I would be able to use them for something! The napkins are also something we already had, but that beautiful little grainsack stripe holiday ornament was something we made! We make these as one of our holiday products for our store and are originally for the tree, but I have found MANY other uses for them recently! They made a really pretty addition to our table, but I also hung some red ones from my metal cup holder I have over my coffee bar. 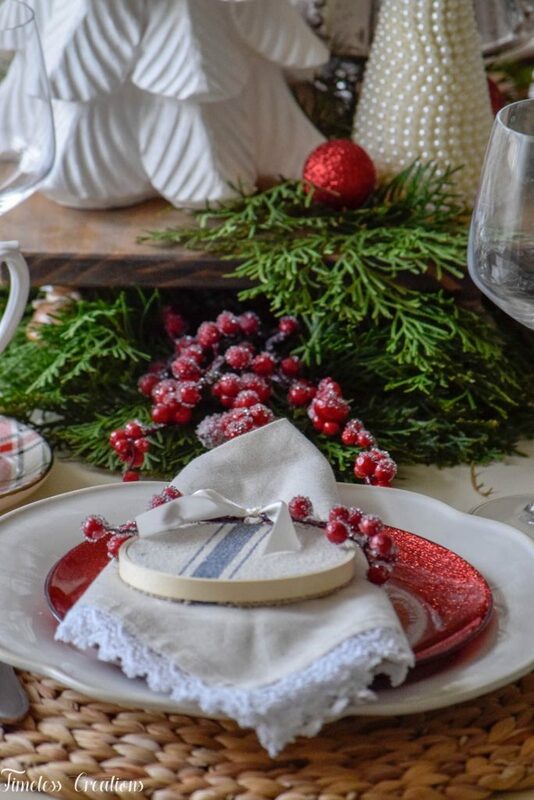 The red berries on the top of the ornaments match perfectly with the table, and I love that the blue grainsack stripe adds another subtle color to the space. It brings the perfect amount of jazz to the table settings! 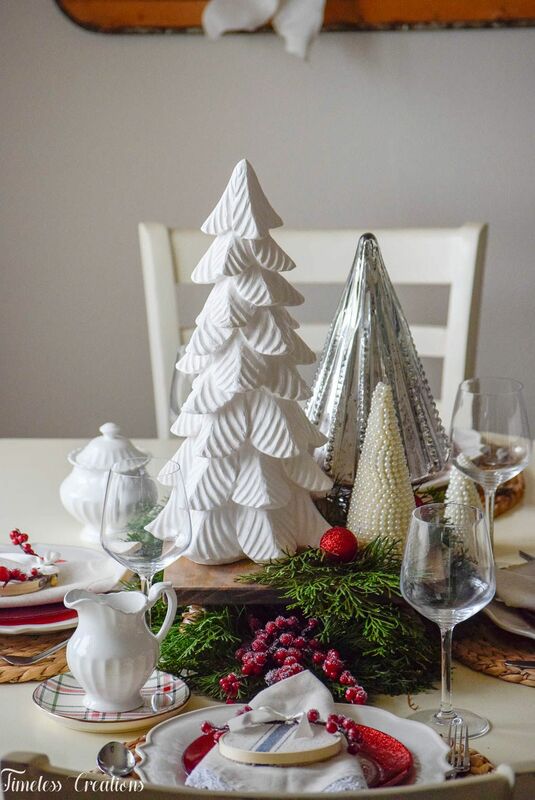 We had such a fun time creating this very festive Christmas tablescape this year! I love seeing how different our tables and decor gets throughout the years. Well don’t forget to take a look at the other amazing holiday decorating and recipes from the other bloggers this week! 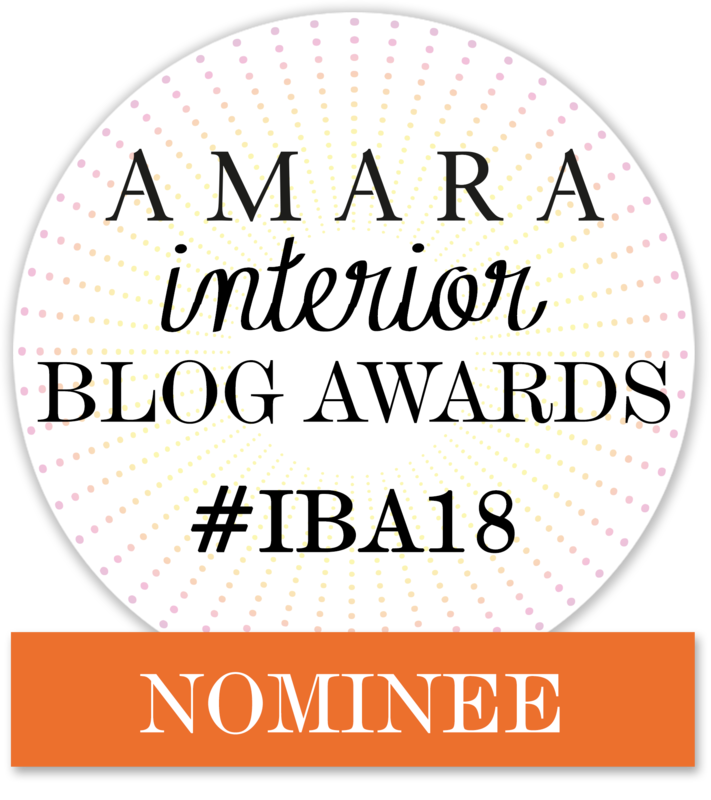 See their posts via the links below – I’m telling ya, you won’t be disapointed! You guys set the most beautiful Christmas tablescape! 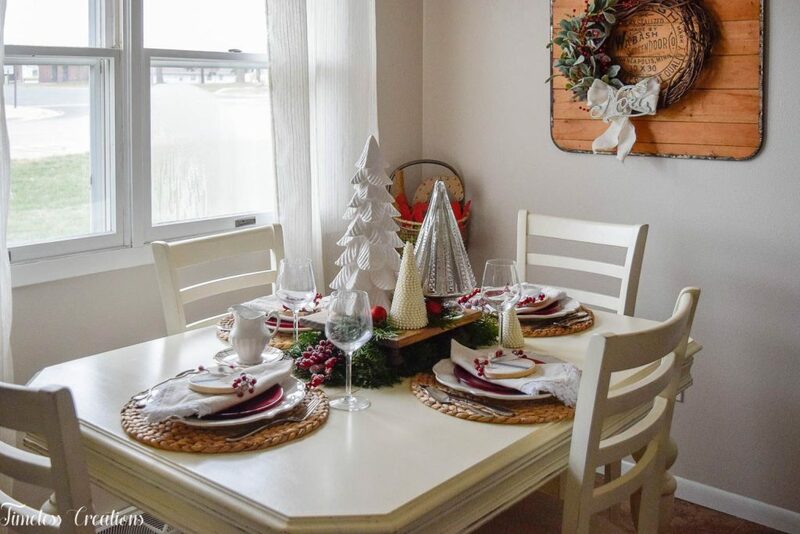 I love all the neutral tones and Christmas tree centerpiece is so pretty. Your grain sack Christmas ornaments are just too cute! So happy to be hopping with you! Thank you Michelle! Glad you like those ornaments 🙂 Merry Christmas! Everything looks so warm and welcoming! LOVE the pops of red! 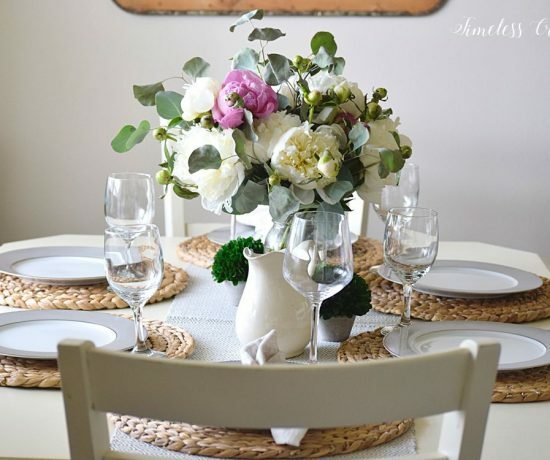 I am grinning from ear to ear after seeing your tablescape! It’s super cute and happy. 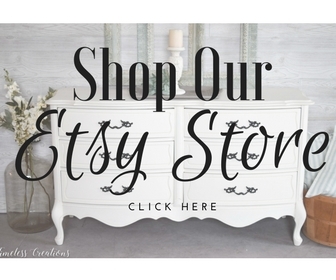 I am now off to check out your Etsy store! Woo hoo! I love that riser! Thanks for sharing and I’m super excited to be hopping with you. Merry Christmas Y’all. 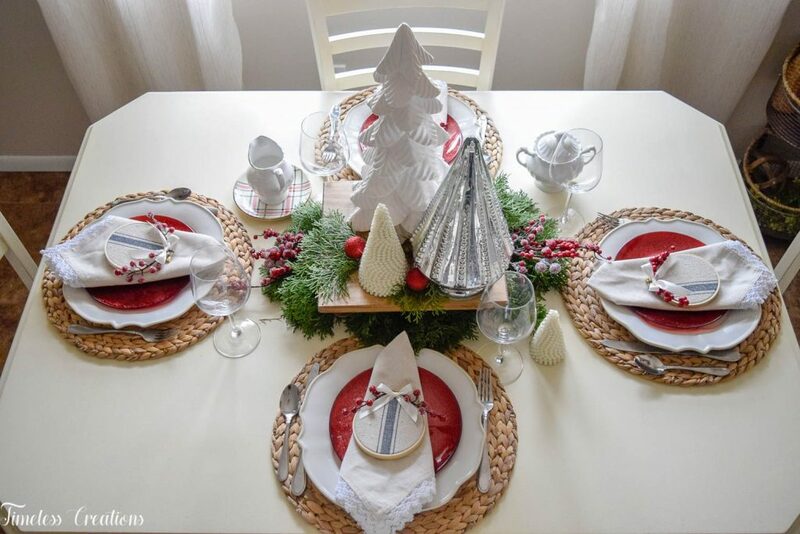 I love how you showed that a smaller table can still be decorated beautifully!! Not everyone has a long table to set up a tablescape!! Thanks for sharing!! Yea! We don’t have room for a large table in a beautiful dining room, but my little table in the eat in kitchen can certainly still look nice! Thanks Malinda!! 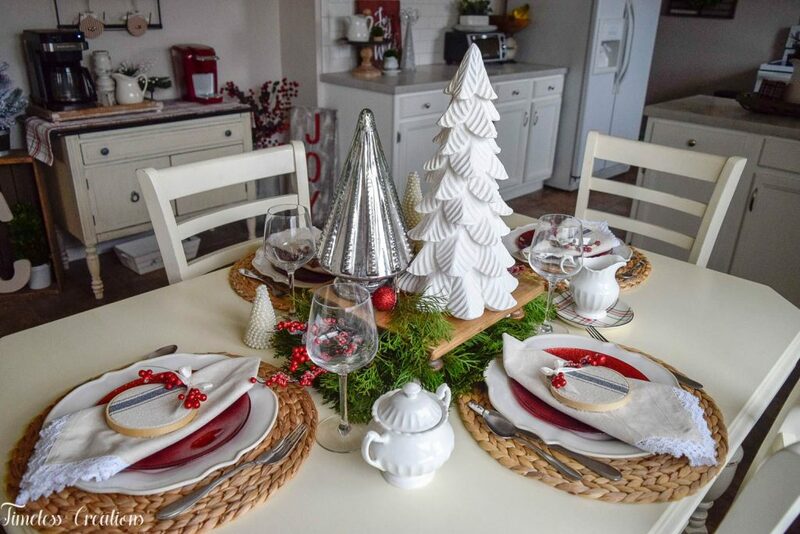 This table is so pretty and perfect for the holidays! It was fun touring with you this week! Pinning! Absolutely beautiful. Thanks for sharing at the To Grandma’s House We Go DIY, Crafts, Recipes and more Link Party last week. I pinned this! Hope to see you again this week. What a beautiful table. 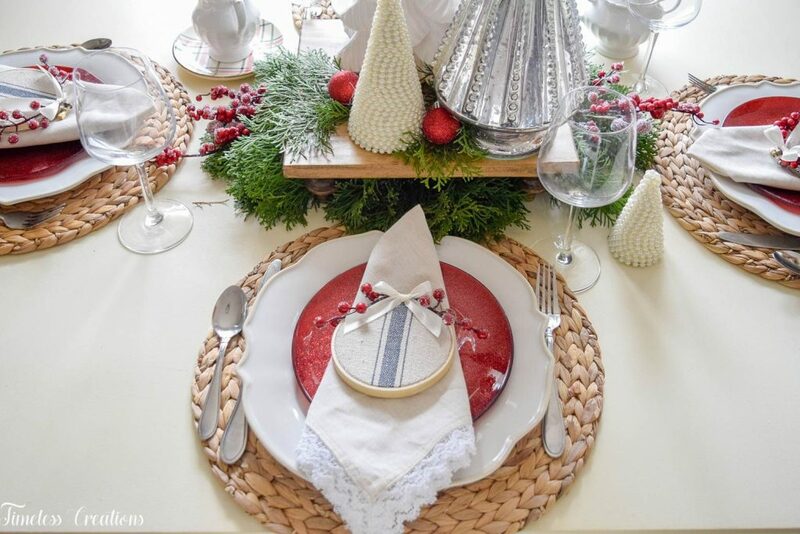 I love that gorgeous pop of red with the texture of those rattan placemats. Looks wonderful. Beautiful tablescape as always, ladies! Hope you had a wonderful Christmas! !